Cambridge City Councillors are to review the sections of the council’s constitution relating to people observing, speaking at, and reporting on council meetings at their Civic Affairs Committee meeting on the 17th of September 2014. Ministers gave councils a month to update their rules before a new law on recording local government meetings was introduced. Cambridge City Council didn’t bring its constitution into line with the law before the law started to apply but are now considering doing so. I am planning to attend the meeting to urge councillors not to create local rules which are not in-line with the law, and not to introduce additional restrictions to observing, reporting, and recording from council meetings. Councillors are to consider, at the meeting, if to introduce rules to: “protect children, the vulnerable and other members of the public who actively object to being filmed”. It is difficult to comment without knowing what, if anything, councillors might propose. I think the law allowing filming of everyone at council meetings is reasonable and I hope our local councillors don’t seek to undermine it. 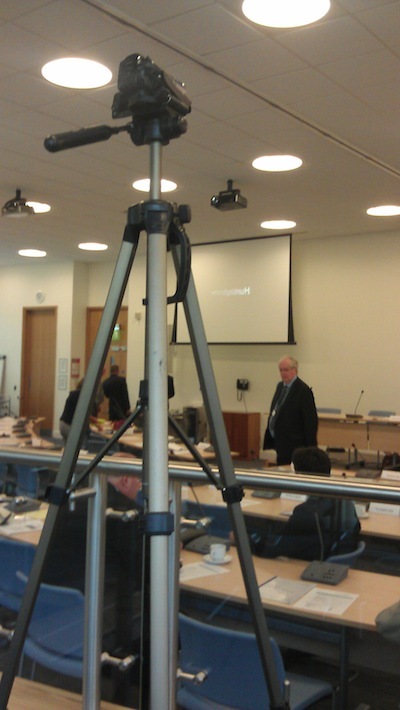 Filming Cambridge City Council over the past few years has been challenging. The recent change in the law has I think been positive; at a recent committee meeting there were two people with video cameras, and someone with a professional camera and a dicta-phone recording proceedings; and that was activity which was overtly visible. I would like to see councillors being a bit more positive; and making clear that merely taking notes, writing tweets, filming, or recording a meeting can not itsself be deemed disorderly and result in an individual being thrown out of a council meeting. I also intend to raise a concern about the changes to the rules on throwing members of the public out of council meetings; and to draw attention to a missed opportunity to improve bring the councils rules and practices into line with each other in relation to public speaking at area committee meetings. The Council supports the principle of transparency and encourages filming, recording and taking photographs at its meetings that are open to the public. It also welcomes the use of social networking websites (such as Twitter and Facebook) and micro-blogging to communicate with people about what is happening, as it happens. I would rather see the council take that more positive line, if not in the constitution, then at least on its website, on meeting papers, and in chairs’ remarks when opening meetings. I think the intent of the proposed rules appears to be that an individual could be asked to stop filming, on the grounds of disruption, prior to the process for removal from the meeting on the grounds of disorderly conduct being commenced. In other words someone filming can be asked to stop filming on the grounds of disruption rather than the first step being a warning that they could be completely thrown out of the meeting. I think that is a good and proportionate idea, but the intended procedure could be made clear with a reference to rule 36 of Part 4A from the filming rules. It is not clear from the recommendation that deletion of the existing section of Appendix F A of the council’s constitution relating to audio/visual recording and photography is to be removed and replaced by the above text though the report makes clear that is the intent. Councillors are though invited by the report to consider adding extra restrictions to filming, recording and reporting meetings which in my view would be incompatible with the law. I intend to urge them not to do so. “The council…..should consider adopting a policy on the filming of members of the public, and ensure that they protect children, the vulnerable and other members of the public who actively object to being filmed, without undermining the broader transparency of the meeting. The “Government guidance” referred to is the Open and accountable local government: plain English guide. I think it is a great shame the “plain English guide” produced by the Government is at odds with the law. I had previously, while it was in draft form, suggested it ought be corrected. Generally I think those who speak at council meetings are doing something in public and are generally seeking to influence public, civic, decisions and/or how public money is spent so should expect what they do to be recorded and reported. I think the vast majority of those seeking to lobby, or ask questions to, councillors want their points to be heard and to reach as wide an audience as possible so are positive about recording and reporting on council meetings. Recording and reporting what happens at council meetings can help representatives of campaign groups report back to their members on what has happened. It seems wrong to me for the council to seek to prevent the filming or recording of contribution which could be reported on the front page of the local paper. Children from time to time make contributions to council committees. In particular at the annual council AGM there are cadets, and sometimes a work experience student, mentioned or participating during formal proceedings. There are also invited school pupils. I don’t see why there needs to be any special treatment for children; I think it would be wrong to start requesting the ages of those seeking to use the public speaking slot at council meetings. I can request and I will happily do so if necessary that filming proceedings that those who may not wish to be filmed may be stopped on polite request to the person filming but unfortunately I cannot require that person to stop filming if they do not comply with that polite request. I can of course stop recording if it disrupts the meeting itseelf. 36.1 If a member of the public interrupts the proceedings at any meeting the Mayor or Chair shall warn him/her. If s/he continues the interruption the Mayor or Chair shall order his/her removal from the Council Chamber or Committee Room. I think it is confusing, and adds unnecessary complexity, to cover the same subject in two different parts of the constitution. I am concerned that the language used in the proposed new paragraph refers to people being “excluded” rather than “removal” or “cleared”. I don’t think people should be pre-emptively prevented from observing a council meeting on the grounds of preventing “disorderly conduct or other misbehavior”. I can see the proposed wording is derived from Section 1(8) of the Public Bodies (Admission to Meetings) Act 1960 though it is not clear to me what powers are being referred to in that section. make clear that merely filming, tweeting, recording, or taking notes at a meeting cannot alone be considered disorderly conduct. state any exclusions must relate to the minimum number of people, and be for the minimum time necessary, to maintain order. It is not completely clear from the report to councillors if the proposal is to replace the original text with the new, or just add the new text. I note that while there is wi-fi in the council chamber the password for it doesn’t appear to be proactively made available. I personally spotted the laminated card containing the password while observing a meeting in a committee room, but have never spotted attention being drawn to the facility in the chamber. It is great to see this confirmation that the desk in the chamber is available to all. Access to power points and toilets are other facilities the council provides; this is particularly useful during very long council meetings. What actually happens at area committees, in particular during “open forum” agenda items is not reflected in the current rules, which officers are recommending remain unchanged. In practice sometimes questions have to be submitted in advance on slips of paper made available at area committee meetings; and invariably at area committees the formal approach requiring notice, and giving three minutes per questioner with two minutes for a supplementary question or a response is not followed. The approach is much less formal which is sometimes to the benefit of public speakers, and sometimes not. Sometimes an area committee is very open and inclusive; members of the public are able to contribute throughout, but at other times they are not. From my perspective the treatment of the public at area committees has been very inconsistent. That inconsistency and element of surprise is I think the biggest problem. When I attended my first area committee I saw “open forum” on the agenda and didn’t realise I would have to submit a question in advance to raise something. Someone attending an area committee but not being able to raise the point they came to make because they didn’t submit a question slip and for whatever reason the chair doesn’t ask if there are any others who want to contribute is something which still happens. Where restrictions on contributions have from time to time been imposed, for example at the North Area Committee, it has not been clear if speaking during the open forum removed, or reduced, a member of the public’s ability to contribute during a subsequent policing agenda item. This entry was posted on September 17, 2014 by Richard Taylor. I spoke at the meeting to urge councillors to bring their rules into line with the law. I hope they weren’t just deferring the debate until full council; but there was no sign of that. I would hope the full council will accept the recommendation from the committee. i. Welcomed the recent changes to the law regarding recording Council meetings and encouraged the committee to support the proposed changes to the Constitution. ii. Expressed disappointment that the new legislation and the guidance regarding provision for those not wanting to be filmed did not align with one another. Suggested that local authorities lobby the Government in order to address this. iii. Highlighted Cambridgeshire County Council’s more open and welcoming approach to members of the public wishing to film and report on meetings. Suggested that the City Council’s approach could be improved. The committee received a report from Head of Legal Services regarding constitutional changes to comply with legislation on recording officer decisions and recording meetings. Councillor Cantrill welcomed the report and supported Mr Taylor’s comments. It was important that the Council was as open and transparent as possible and it was suggested that in-house webcasted should be investigated further. i. Recommend Council to adopt the revised ‘Part 4B- Access to Information Rules’ set out in the appendix of the officer’s report. ii. Authorise the Monitoring Officer to make consequential changes to other parts of the Constitution that refer to recording meetings and public speaking rights.